In the upcoming Apache Camel 2.12 we have improved the internal routing engine to dramatically reduce the stacktraces, our end users will see when an exception occurred and was logged. During the development of the improvement we had a small sample route for benchmarking. And in the processor we forced an exception being logged. In Apache Camel 2.11.x the stacktrace would be around 40 lines. The Camel team managed to reduce this down to 15 lines. And the bottom 6 lines is 3 from the JVM and 3 from the seda consumer. So in between the routing engine is executing; and that's where we have optimized the code. So we went from (40-6 = 34) to (15-6 = 9). Eg before we had 34 lines during the routing, and that is down to 9 now. Camel is still executing the same functionality. As an end user there is no functionality turned off or missing now. Its all still there and being executed; just in a different way. What we did was refactor most of the internal cross cutting functionality into a single entity CamelInternalProcessor (name subject for change), and fold that into a single stack-frame being executed. This improvement is internal changes only, and all end users Camel application is upgrade compatible. For our end users who have been debugging the Camel source code, this is now also simpler, as we added code comments in the CamelInternalProcessor with pointers how to do this easier, and which part you can safely skip over, to make your debugging experience easier and faster. And speaking of debugger. Then we also added a new BacklogDebugger, which is a Camel routing debugger JMX MBean which is ready to use for tooling and end users. For example you can use it easily set breakpoints, single step a message in the routes, and edit/view its message content. Now for the graphical UI, then James Strachan is hacking on hawtio to add this in the upcoming hawtio 1.2 release. And since its JMX based you can always use it from a JMX console such as JConsole or JVisualVM. And for the brave a plugin to Eclipse / IDEA could be developed to integrate it with their native debugger; but thats a big task to take on. For further details and background on the stacktrace improvement then you can take a look at the ticket CAMEL-6077 and our discussion on the Camel developer mailing list. As well we have a sample of the before and after stacktraces in the CAMEL-6077 ticket. 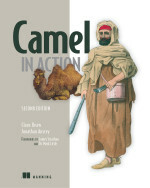 I have the pleasure of speaking at a webinar on thursday focusing on Apache Camel components. Any integration requires connectivity to applications, services, or databases. Connectivity could be a file drop via FTPor sFTP, a JDBC call to a database, or a webService call to an application. Apache Camel comes with 100+s Camel components or connectors that enable this functionality. To archive that Apache Camel comes with 130+ components out of the box, ready for you to use. In this webinar we take a look at some of the popular components, as well how you can write your custom components. The webinar is a mix between slides and live demonstration. The session is scheduled for one hour, where we leave about 10 minutes at the end for Q and A. To use Apache Camel components to create faster integration solutions. To build custom Camel components. The webinar is free and you can register for the event from this link. 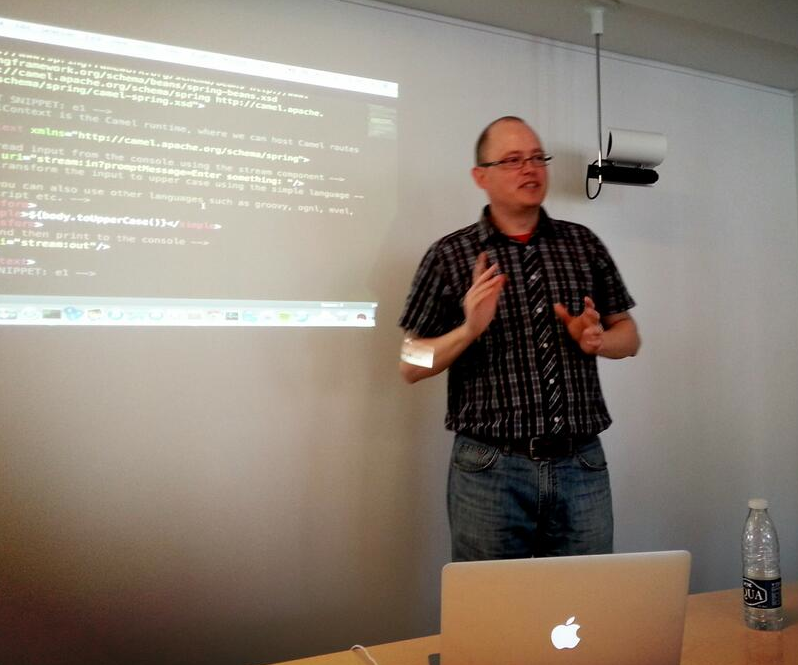 Last week I visited Århus, Denmark to give a presentation about Apache Camel. 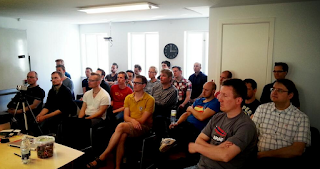 This event was organized by JavaGruppen, and OpenMinds was kind to host the event, in their beautiful office centrally located in Århus. Thanks to Thomas Salling whom was so kind to pick me up at the train station, I arrived safely and in time for the event. At the event we had a great turnup, of about 25 people. And we were almost out of free chairs, and space in the room, as you can see from the photos. After the event we went for beers at Sct. Clements which is a brewery inside the restaurant. 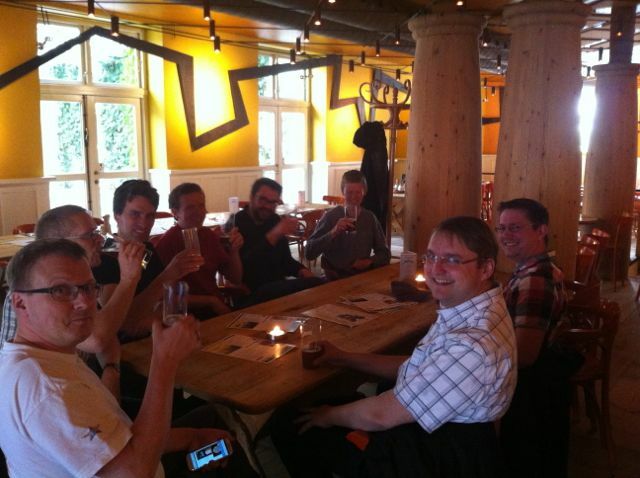 Having beers at Sct Clemens after the event. My presentation was 2 hours and with a mix of slides and live demonstrations. And as well taking in questions. We had a 10 minutes break at the one hour mark. Giving such a long presentation is of course a challenge. The response from the attendees was positive and they didn't get bored etc. And we had about 2/3 of the attendees whom didn't know about Apache Camel. I also had the pleasure of meeting with two former colleagues whom I haven't seen in over 10 years. It was great to see you Michael and Simon. Søren Berg Glasius, whom is known in the Groovy and Grails communities is head of organizing the GR8Conf conferences. The next GR8Conf takes place in a couple of weeks in Copenhagen, Denmark. So he is testing his video and presentation equipment, so we used this opportunity to video tape my entire presentation. Unfortunately there was some problems with the HDMI connection so we had to settle for VGA. But the end result is still very great. The video features both the slides and the camera feed in the same picture. This makes it very easy to follow the presentation. Soren was so kind to invite me as a guest to the GR8Conf, so I will drop by in Copenhagen on the 23rd of March. Looking forward to see how far the Groovy and Grails have reached. We do see more and more people use Grails and Camel. Likewise the gradle build system seems to be cool as well. The videos of the presentation is already online and you can find them here. And the slides is also uploaded to slideshare here. Thanks to Javagruppen and OpenMinds for hosting such a great event. I had a great time visiting Århus.